The scene is Act II, scene 1, Sir Henry Flutter's dressing room. He has called for his wife, and she enters "with Knetting in her hand." They quarrel and Sir Henry tells her to "retire with your trumpery work - I choose to be alone." But Lady Flutter decides to stay: "Then I'll stay to vex you" (quotation on the engraving). Lady Flutter wears a white dress trimmed with vertical lines, a blue sash, and a black hat with feathers and ribbons. In her right hand she holds her "knetting." 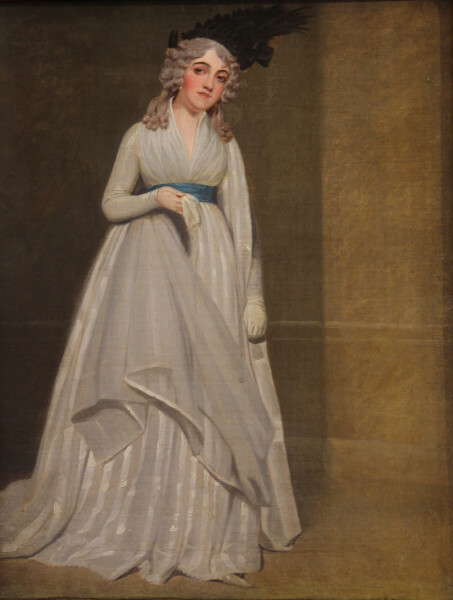 Mrs Sheridan's comedy was first performed at Drury Lane on 3 February 1763, with Jane Pope as Lady Flutter. Mrs Esten never played the role in London.